Tess Stapleton of Fairfield Ludlowe again dominated the action in the hurdles with an 8.27 time leading the prelims and then an 8.26 in the finals.Wilton's sophomore Shelby Dejana was 2nd in both phases and got down to a PR of 8.47 in the finals, and Ayesha Nelson of Hillhouse equaled her PR in the finals with an 8.48 for 3rd. Kayla Clark and Nia Christie of St. Joseph were 4th and 5th, and Aliya Cameron of Sacred Heart was 6th. Four of the hurdlers are sophomores, and all but Nelson will be back next year. 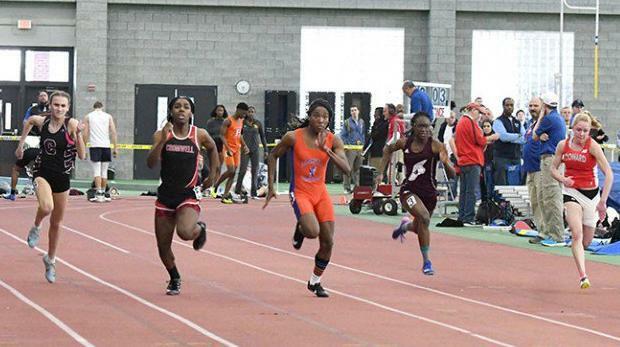 Bloomfield junior Terry Miller is still US #2 after a 6.95 in the CIAC finals, but she now has the state meet record after lowering her time a bit from prelims. Cromwell's Andraya Yearwood made it close by dropping a PR of 7.01 in the finals. Further back were LJ champ Chelsea Mitchell of Canton in 3rd, followed by Kate Shaffer of Conard, Ayesha Nelson of Hillhouse, and Maya Mocarski of Ludlowe. Terry Miller got the 55-300 double, leading 600m-winner teammate Jillian Mars over the line by almost a second. Close behind Mars was a fast-closing Jada Boyd of Hillhouse, and then Samantha Forrest of Glastonbury, Cori Richardson of Windsor, and Kate Carleson of Plainfield. Jillian Mars got Bloomfield a third sprint crown in the 600m with a win by more than a second, as she nudged her PR down by .05 to 1:36.46. Hillhouse's Jada Boyd took 2nd with a 1:37.60 to go with her 3rd in the 300m. A close battle for 3rd resulted in Simsbury's Elsa Martin in 3rd and East Hartford's Kamillah Diaz in 4th, and then Emily Alexandru of Trumbull in 5th, and Love Melton of Hamden in 6th.